The attractive rim-flow pool on the main deck is a great place to spend time in during the heat of the summer months - little beats lounging around on the deck with a cold drink in hand watching animals coming to drink at the waterhole in front of the lodge! The food at 57 Waterberg is garnering an increasing number of rave reviews from guests - hats off to the enthusiastic chefs Gabriel and Lukas for their imaginative and high-quality menu offerings! Enthusiastic management and staff create a truly welcoming ambience where nothing is too much trouble - and with only 5 rooms, chances are you'll get to feel like part of the family! the superbly friendly attitude and excellent personal service from the entire team at 57 Waterberg is what really stands out in the numerous rave reviews handed out by guests! 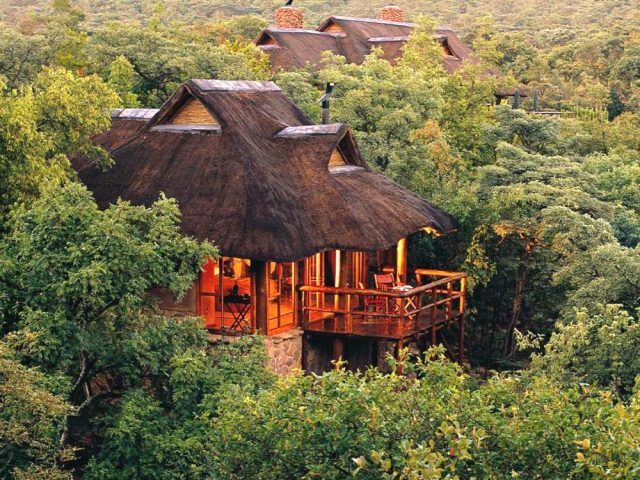 The Welgevonden has to be one of the most popular reserves for Bushscapes clients – the combination of quick and easy road access from Gauteng, decent game viewing in a variety of scenic landscapes with no malaria present, not to mention the presence of a wide range of very good lodges at similarly attractive prices makes the Welgevonden reserve a winner! So it’s always good news for us when a new lodge opens here, and 57 Waterberg has not surprisingly quickly established as a firm favourite. We referred to this as a “new” lodge, but in fact 57 Waterberg was originally established under the name MolenVliet Lodge but was not really operating on a commercial basis. The change of name to 57 Waterberg saw this approach change and sales being opened up to the general public who have taken to the lodge with enthusiasm. 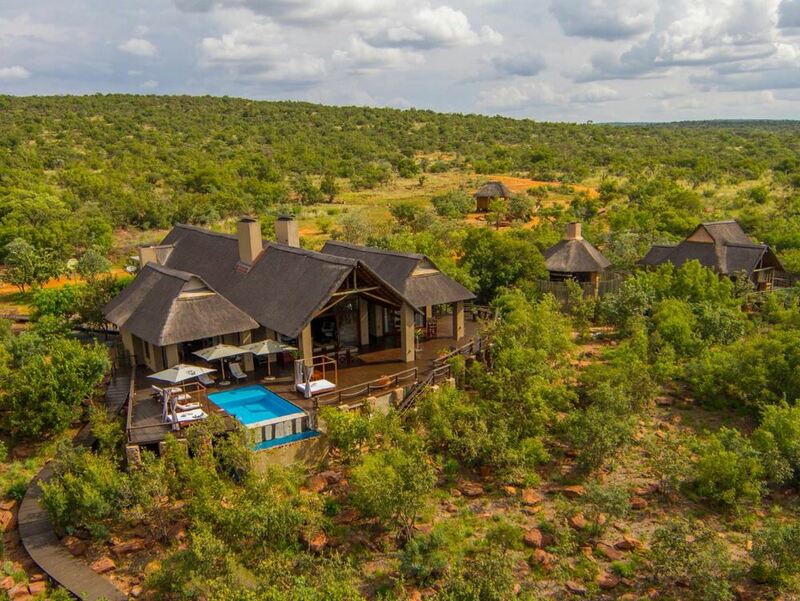 Similar to many of the other Welgevonden lodges, 57 Waterberg consists of just 5 luxurious rooms, so guests can look forward to a really personal and intimate experience where you’ll no doubt leave on first name terms with the friendly team that runs the lodge, not to mention your fellow guests. 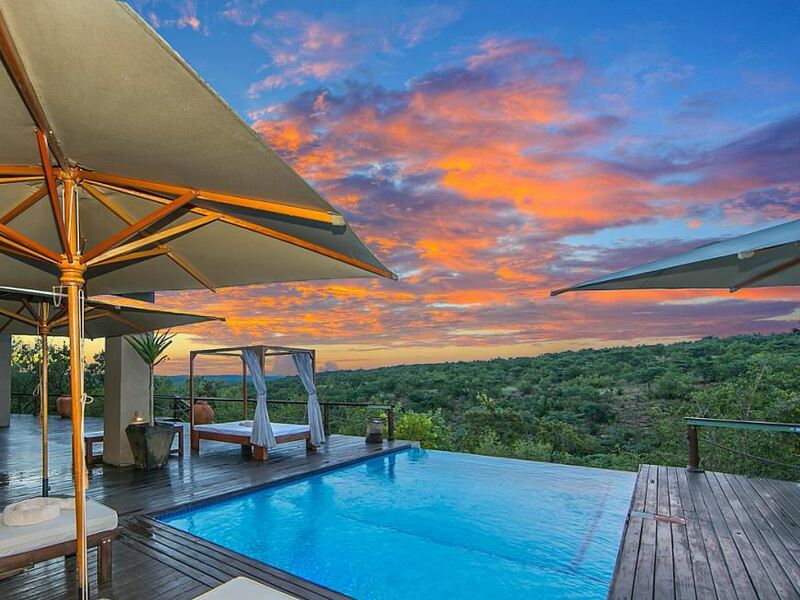 In fact, the superbly friendly attitude and excellent personal service from the entire team at 57 Waterberg is what really stands out in the numerous rave reviews handed out by guests! Another thing that stands out about 57 Waterberg is the sheer size of the rooms here – at a minimum of 80 sqm they are some of the most spacious on the reserve and are extremely well equipped too. Reached by wooden walkways running from the main public area, the 5 suites consist of 3 Luxury Chalets and 2 slightly more expensive Honeymoon Chalets. The difference between the 2 room types? Quite simply the Honeymoon Chalets are identical save for a jacuzzi on the private deck overlooking the bush which adds a desirably romantic edge. Massive king-size beds with quality linen, a Nespresso machine and gas fireplaces to make the rooms cosy even in the depths of winter are just some of the features that will make your stay even more comfortable. The lodge’s public areas are similarly welcoming and comfortable. As befits a lodge catering to just 10 lucky guests, the public areas are not massive and imposing but are rather on a much more cosy scale. The highlight probably has to be the rim-flow pool on the main deck – during the warm summer months, you’re likely to spend many happy hours on the deck whiling away the time with a cold drink in hand whilst keeping a keen eye out for any animals coming down to slake their thirst at the waterhole located immediately in front of the deck. If that sounds altogether too energetic, then why not enjoy a relaxing massage in the comfort of your suite! 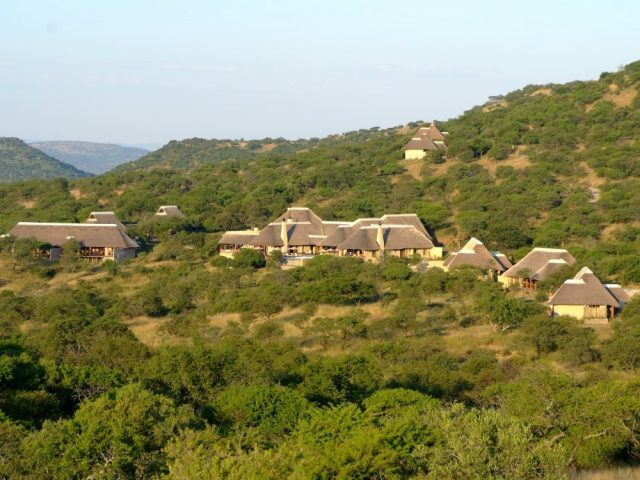 Away from the lodge, you’ll enjoy 2 game drives every day through the scenic landscapes of the Waterberg. No off-road driving is allowed in the Welgevonden given the sensitivity of the vegetation, but guests can see a wide variety of interesting game on the reserve’s 36 000 hectares, including the Big 5 of course. Guests consistently rave about the knowledge and enthusiasm shown by the rangers here, who go out of their way to deliver a memorable wildlife experience to guests. Upon your return from game drive, the one thing that you can be pretty sure about is that your tastebuds are in for a real treat! After being a bit of a weak spot initially, the food at 57 Waterberg has latterly become one of the lodge’s major strengths. Take the time to read the guest reviews and you’ll see that most of them wax lyrical about the superb quality of the food conjured up by chefs Gabriel and Lukas! 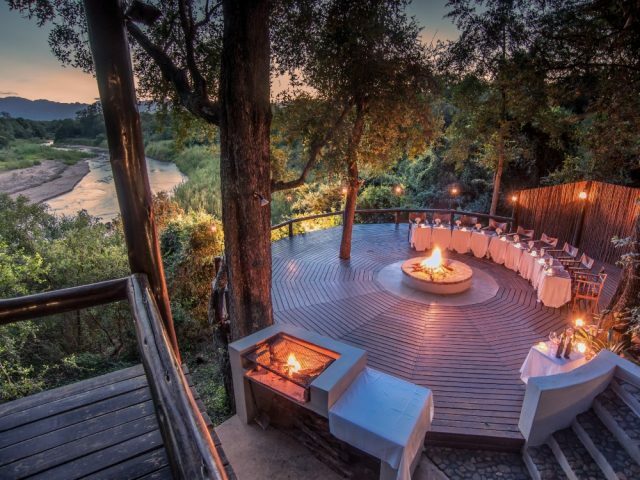 Whether in the formal dining room, under the stars in the boma or perhaps by romantic candlelight on your private deck, you can look forward to seriously delicious meals served by some of the friendliest staff around! Children of all ages can be accommodated on a blow up mattress when sharing with adults in a Luxury Chalet at 57 Waterberg.